One of the many mystifying acronyms you are likely to encounter around Hanford is “CLUP,” which is short for the “Comprehensive Land Use Plan.” The CLUP is an environmental impact statement that examined frameworks for future land use at the Hanford site, one of which was adopted by the U.S. Department of Energy (DOE) in a “record of decision” (ROD) in late 1999. Along with its own proposals and a “no action” alternative, the DOE examined alternatives submitted by local, state, and tribal governments as well as well as other federal agencies. At 523 pages it is a beast of a document, but it is definitely worth a read, even after 15 years. It contains volumes of information about Hanford’s history, geology, ecology, regulatory framework, and geography. It also embodies the multiple and in many cases incompatible demands on site uses. Not only must legacy waste and contamination be responsibly managed and remediated—an incredibly difficult problem in itself—but it must be done while preserving sensitive ecosystems, fostering biodiversity, allowing for various types of recreation, protecting cultural resources, conserving historical artifacts and sites, promoting economic development and diversification, and expanding research opportunities. The CLUP raises vexed, big picture questions that underlie much of the politics of the cleanup: Toward what end is Hanford being remediated? Which relationships to this “landscape” will be prioritized and protected, and which will be marginalized? To what degree is compromise between these competing demands desirable or possible? Different visions for the future of the site are mapped—literally and figuratively—in this document. They are also quantified. 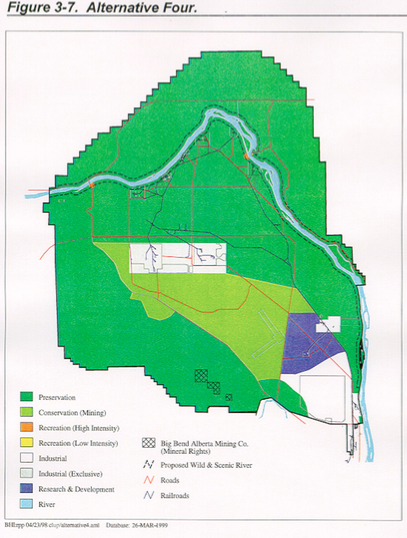 The percentage of the site designated for cultural and ecological preservation, for example, ranged from 94.89% in the Nez Perce proposal to 6.08% in the local government alternative, and the amount set aside for industrial purposes range from 1.41% to 12.06% for these proposals, respectively (3-56). The local government alternative also included 16.17% of the site—much of the Wahluke Slope (now part of the Hanford Reach National Monument)—used for agriculture, while no other alternatives included farming. Local governments often supported strong clean up standards and the protection of scenic natural landscapes, but the Tri-Cities’ economic dependence on Hanford led to a long history of booms and busts as federal spending ebbed and flowed. Local communities and their congressional representatives have, as a result, been strong advocates of expanding and diversifying Hanford’s mission for most of the site’s existence (see: Atomic Frontier Days). This advocacy was important to the introduction of nuclear energy generation at the site, for example, as well as the creation of the Fast Flux Test Facility and, more recently, the Manhattan Project National Historical Park. Local agricultural interests and some county governments argued that a history of agricultural use on the site was forcibly interrupted by the federal government. Where possible, they argued, this history of farming should resume and local control should be reestablished (see: Future-histories of Hanford). Indigenous communities, however, would likely benefit little if at all from expanded agriculture, industry, or tourism at the Hanford site. 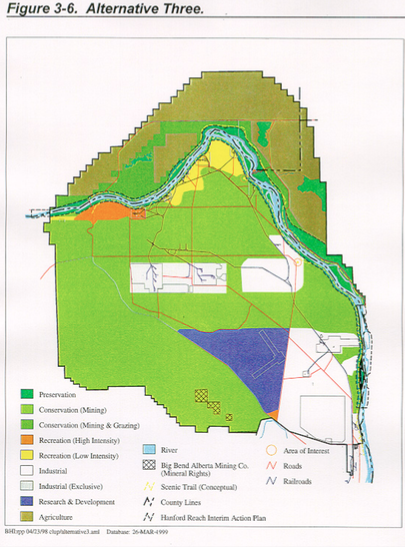 The Confederated Tribes of the Umatilla Indian Reservation’s (CTUIR) alternative argued for the removal of “all vestiges of nuclear weapons production from the Hanford Reach,” including the the-proposed B Reactor museum that is slated to be included in the Manhattan Project National Historical Park. Tribal governments often point to the 13,000+ year history of land use at Hanford, the site’s significance to religious and cultural beliefs and practices, and the treaty rights that entitle tribal members to continue using the site. In 1855 representatives of the Nez Perce, Yakama, and CTUIR signed treaties ceding most of their territories—including the Hanford site—to the federal government, but they reserved certain rights within their former territory, such as fishing, hunting, and erecting temporary structures. The details of how these treaty rights apply to Hanford has not been settled, and this is part of the reason why many of the standards and frameworks dealing with Hanford, including the CLUP, may ultimately prove to fall short of the trust that is legally required of the federal government. The expansion of industry, agriculture, and recreation on site—in addition, of course, to inadequate cleanup standards?? ?—could affect the ability of indigenous communities to exercise their treaty rights, as well as create additional risks for “cultural resources,” such as gravesites, artifacts, and sacred places. When I have heard the CLUP referenced in Hanford Advisory Board meetings and interviews with various individuals involved in Hanford, it was usually invoked to suggest that the issue under discussion has already been settled, and no further discussion is needed. 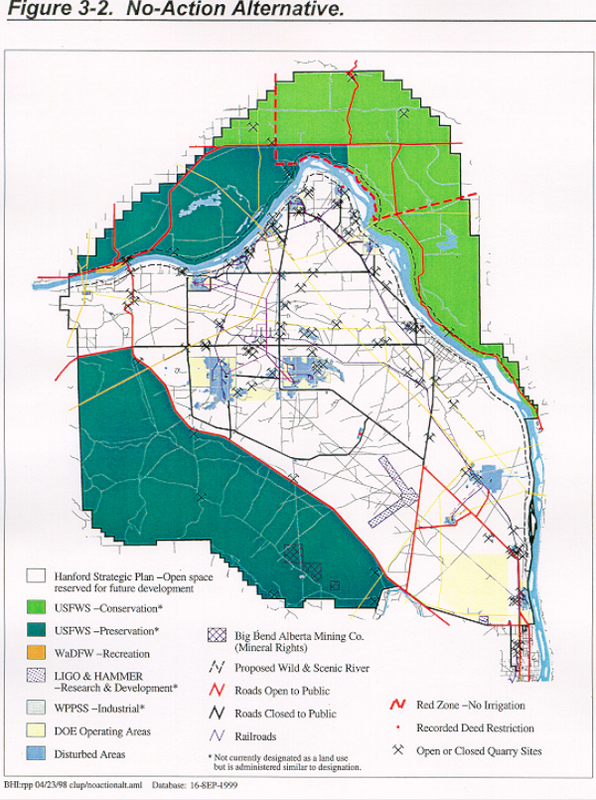 The implication was usually that future land uses designated in the CLUP justify lower cleanup standards. 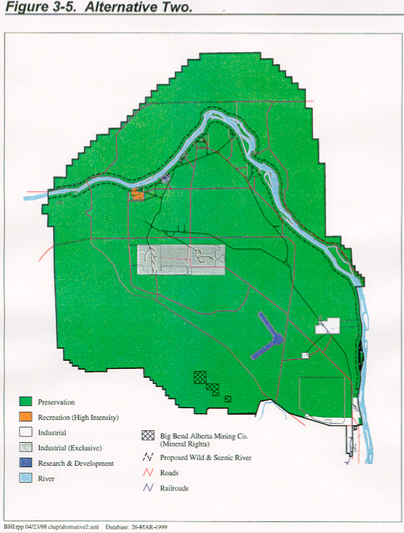 If an area is slated for industrial or “light recreational” uses, then why spend more and put more workers at risk to clean it up to residential standards or incorporate tribal use scenarios, which involve more exposure pathways through, for example, the consumption of plants and animals from the site? Why worry about how irrigation will affect the migration of radionuclides into the groundwater when agriculture will be forbidden on site? 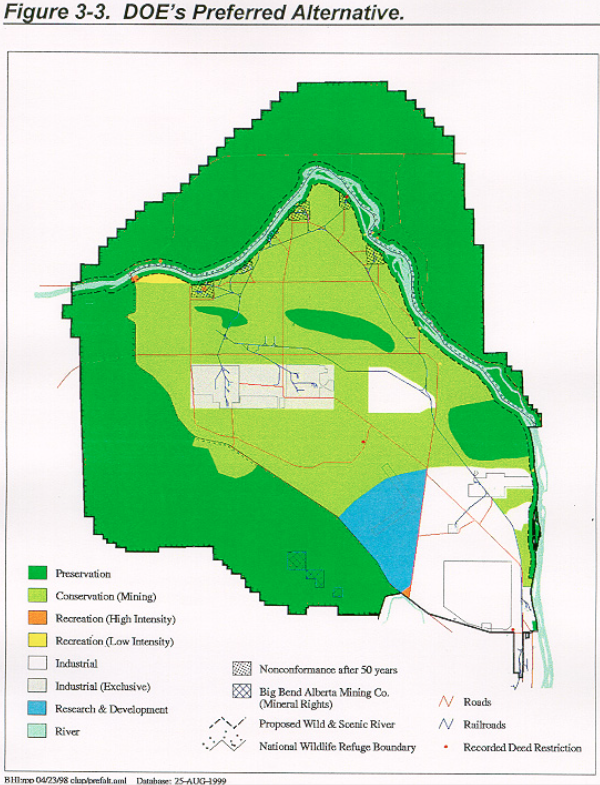 This is a problematic understanding not only of what the CLUP is, but also of the limits of all land use planning in the face of long-lasting radioactive and toxic contamination and waste. 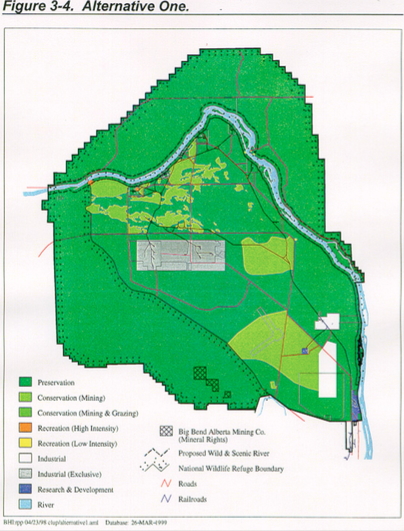 The CLUP is meant to be a “living document designed to hold a chosen course over an extended period of development and management of resources,” while retaining the flexibility accommodating “a wide spectrum of both anticipated and unforeseen mission conditions.” It was supposed to be reassessed every five years through the “NEPA Supplemental Analysis” (SA), although only two SAs have taken place since 1999. The latest SA was just approved on May 12. 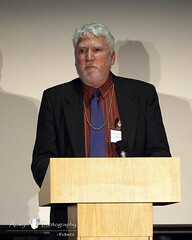 It is also, as I mentioned, unclear whether it is consistent with treaty obligations: the Nez Perce and CTUIR governments “agreed to disagree” with the DOE over the interpretation of treaty rights, reserving the right to assert a stronger interpretation of these rights and their implication for land use at a later date. This means that land use plans have and will change, even in the short term. Finally, much of the radioactive contamination and waste at Hanford now will remain dangerous for tens of thousands of years or more. I-129, one of many radionuclides found at Hanford, has a half-life of 15.7 million years. Modern Homo sapiens have been around for roughly 200,000 years. Even designing warning signs for the relatively modest stretch of 10,000 years seems like an impossible task. The assumption that land use could be controlled or predicted for even hundreds of years strains credulity. This means that there are serious limitations that need to be considered when using the CLUP to inform cleanup standards.